Kegco's hassle-free Door Mount Homebrew Kegerator Kit comes with two new ball lock kegs, allowing you to ditch the endless bottling and save time and money! It comes complete with all of the high-quality commercial grade beer components you'll need to turn a plain refrigerator or freezer into an impressive two product beer dispenser, like ball lock keg couplers, a lightweight 5 lb. aluminum CO2 tank, and a pro series dual gauge regulator that lets you monitor both the output pressure and the volume of CO2 left in the tank. 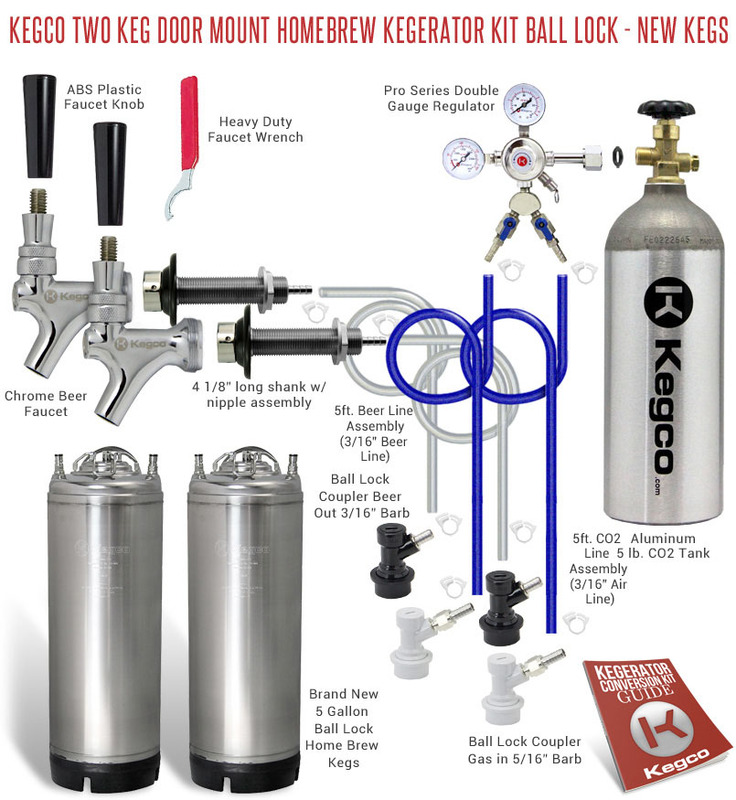 Kegco includes detailed assembly instructions with every conversion kit, and helpful product specialists are available at 1-800-710-9939 for additional support, making it easier than ever to make that switch from bottling your beer to enjoying it straight from the keg! These complete ball lock home brew keg tap sets include both a gas in and beer out coupler for easy tapping of ball lock Cornelius Pepsi kegs. The gas in comes with a 1/4" nut and 5/16" hose barb already attached, allowing you to quickly connect it to the same size air line that standard draft beer regulators use. The beer out connector has a 3/16" hose barb that connects to standard 3/16" beer line. These Kegco 5 Gallon Home Brew Beer Kegs are constructed of 304 grade Stainless Steel and are designed for use will ball lock keg couplers. These homebrew kegs, also known as Pepsi Kegs or Cornelius Kegs, have permanently molded rubber bottom skirts and stainless steel strap handles for easy carrying. The stainless steel lids fasten tightly to the body and feature a pressure release valve to easily depressurize the keg.